How do I set up Customer Groups? 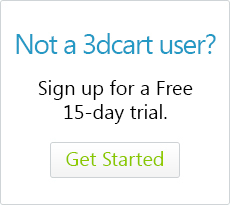 3dcart allows you to create different pricing levels and customer groups for your store. This is a method by which you can offer a different pricing structure to your customers based on which customer group they belong to. A common example of customer groups is a retail/wholesale type of set up, where regular customers are able to purchase your products at the regular price, but special customers are able to purchase your products at wholesale prices, provided they belong to that special pricing group. This will be the name of your pricing group. The group name will display on the various options within the store that take customer pricing groups into consideration. For example, "Allow Access" on the product's Advanced Tab and Category settings, individual customer settings, and payment/shipping configurations that are available to specific customer groups. This will be a brief description of the customer group intended for your own internal reference. Here you will specify a minimum order amount customers must have in their cart before they are able to take advantage of the pricing level. For example in the case of a wholesale pricing group, you may want to dictate that the customers must order a minimum amount of $100 in order to qualify their purchases at the wholesale price level. Use this drop down to select which Pricing Level the group will use. There are 10 individual pricing levels, and they can be set on each individual product's "Advanced Tab." Once you have populated these fields, click "Save" to finish the process. Use this setting to make the customer group non-taxable and waive any tax charges on the group's order. Use this setting if you'd like to allow registration to this group from your store front. In other words, when adding themselves to your store during checkout, customers will be able to select which group they would like to belong to. By default, this setting is turned off, so you can manually move customers to special groups as needed. However, for your purposes, you may want to set this option. Setting this will determine if the customers are automatically approved for the specific customer group they register for. Again, this is left unchecked by default to allow you more control over who takes advantage of special pricing. For example, you may not want all customers to be able to sign up for wholesale pricing. Instead you will want to manually approve them as they register. However, as a merchant, you may have specific needs where you would want to allow automatic registration approval. Therefore, we leave the option in your hands. Use this drop down menu to select the Template style used for the registration page. By default there is only one style to choose from and it is controlled by a template named "registration_0.html." If you'd like to add your own styles, you may upload your own template to your design theme folder. Simply name it registration_1.html or registration_2.html as needed to create additional styles in the drop down menu. Use this text box to customize a message to your customers when they are registering for this group. Note: This text box will take regular text as well as HTML formatted text. This will be the URL to the specific group's registration page. This can be used if you'd like to place the direct URL in an email or external site. For more information on creating and using Customer Groups, please review our online tutorial available by clicking here.